Those banners really do sent out a strong, positive message about our values. I hope you, your congregation and your chapel stay safe on 20 March. Well done. The banners look great, just hope you didn't get arrested! Well done Stephen & all at Bolton Unitarians. 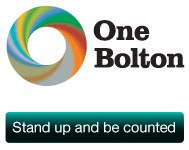 I hope that Bolton stays safe for diversity. "The religion of the future"